General Description of Androgen Receptor. Recognizes a protein of 110kDa, which is identified as,rogen receptor (AR). It reacts with full length,, the newly described A form of the receptor. It does not cross react with estrogen, progesterone, or glucocorticoid receptors. The expression of AR is reportedly inversely correlated with histologic grade i.e. well differentiated prostate tumors show higher expression than the poorly differentiated tumors. In prostate cancer, AR has been proposed, as a marker of hormone-responsiveness, thus it may be useful in identifying patients likely to benefit from anti-androgen therapy. Anti-androgen receptor has been useful clinically in differentiating morpheaform basal cell carcinoma (mBCC) from desmoplastic trichoepithelioma (DTE) in the skin.This MAb is superb for staining of formalin/paraffin tissues. Tested Applications: Immunofluorescence, Immunohistochemistry (IHC). Buffer and Stabilizer: 1mM PBS with 0.05% BSA & 0.05% azide. Anti-ar antibody staining is expected to be primarily localized to the mitochondria. 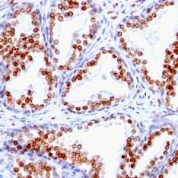 Variations in Androgen Receptor antibody staining intensity in immunohistochemistry on tissue sections are present across different anatomical locations. An intense signal was observed in glandular cells in the epididymis, seminal vesicle. More moderate antibody staining intensity was present in glandular cells in the epididymis, seminal vesicle. 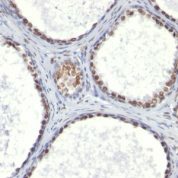 Low, but measureable presence of Androgen Receptor could be seen inglandular cells in the cervix, uterine. We were unable to detect Androgen Receptor in other tissues. Disease states, inflammation, and other physiological changes can have a substantial impact on antibody staining patterns. These measurements were all taken in tissues deemed normal or from patients without known disease. 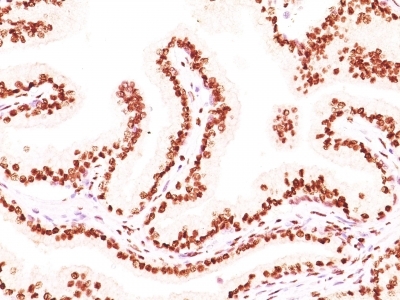 Tissues from cancer patients, for instance, have their own distinct pattern of Androgen Receptor expression as measured by anti-Androgen Receptor antibody immunohistochemical staining. The average level of expression by tumor is summarized in the table below. The variability row represents patient to patient variability in IHC staining. enQuire Bio's Androgen Receptor Anti-Human Monoclonal is available for Research Use Only. This antibody is guaranteed to work for a period of two years when properly stored.